When political times are bad, humor is often the only remedy. 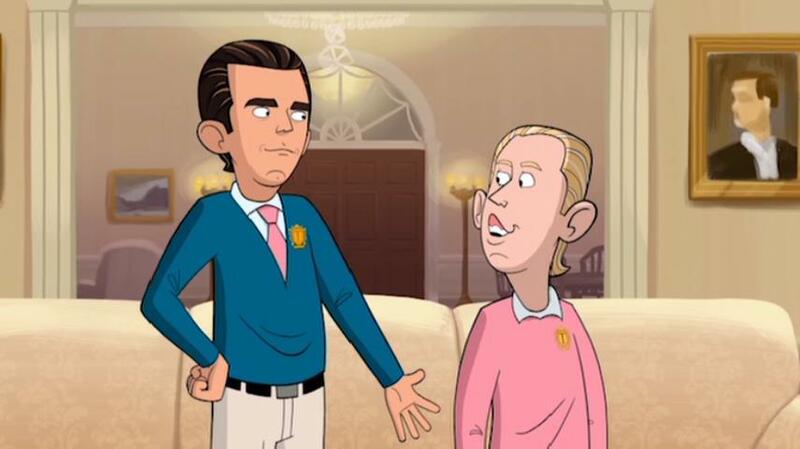 Stephen Colbert tries to help here with an animated parody of President Donald Trump, his family and staff- first seen in small segments on his "Late Show" but expanded to a half-hour series for Showtime (where there's much less content restriction.) Everyone, on both political sides, is depicted here as caricatures as you'd see in newspaper political cartoons- Trump with an orange face and obviously fake hair, his wife Melania looking and talking a bit like "Natasha" from Rocky and Bullwinkle, daughter Ivanka as a stereotypical "valley girl" and (now-former) Attorney General Jeff Sessions oddly as a small gnome-like being, to name just a few. Each episode is given a loose plot that seems to exist mainly just to support the jokes the writers come up with. The shows themselves are uneven, with many not having much of a point despite their titles suggesting otherwise (one titled "Government Shutdown" doesn't even hint at what we eventually ended up experiencing). A few old sitcom plots are recycled, such as where Donald Trump proposes a bigger and better second wedding to Melania, and another where he hires impersonators to stand in for him at events he doesn't want to attend himself. "Rolling Back Obama" is kind of funny, as he attempts to undo everything Barack Obama did no matter what (including hacking up the desk he and countless other presidents used, replacing it with a much larger one.) Still, with all 18 episodes viewed in sequence, it's hard to remember much about them other than the individual jokes and jabs that stand out, showing that this is yet another idea that might have been funny in short segments but simply doesn't hold up extended to full-length episodes. While the picture quality is adequate for DVD standards (colors are very bright in particular), it's clear at this point that the format is simply obsolete. Stephen Colbert even gives a sarcastic introduction saying "Welcome to the increasingly relevant world of DVDs," followed by audience laughter. While I'm a staunch supporter of physical media over any type of internet streaming (which can be taken off-line at any time for any reason), the many clips of this show on YouTube, some of which were uploaded specifically to promote this DVD set, look much better than the discs. Characters are often shown speaking from a distance, and you simply can't see all the details on their faces, plus drawn lines that should be sharp and clear appear jaggedy. The limited resolution is even apparent in the screenshots included here. There is no Blu-Ray release, which would do far better justice to the material. With that format having been around for almost 13 years now and players not costing a fortune anymore, it really doesn't make sense to release current material on standard DVD exclusively. In today's climate, people with a passing interest in this show and those who aren't particular about quality can easily sample the show from its YouTube clips or catch entire episodes in hi-def on Showtime's streaming service or cable channel. Those who would buy actual hard copies of this likely care more about quality and having these shows preserved for historical sake (hopefully in the future we'll be able to look back on this time and laugh), so it would make sense to release them on the higher-quality format. The 2-channel Dolby Digital track is fine for the material, seemingly well-recorded. Dialogue stays centered, with separation for music and sound effects. Hearing-impaired subtitles are included, which help to clarify the often ridiculous dialogue- CNN's Wolf Blitzer (Stephen Colbert) in particular is hard to follow as they've had him speak in a very erratic rhythm. Not having cable, I haven't seen much of him and don't know if this decently mocks him. Billed as "World Class Amenities," the extras in this set provide a good look into the show. Three episodes include commentaries from the animators (the first episode even gets TWO separate tracks) where they discuss the character designs and such- they introduce these as catering to the "animation nerds" out there. Assumedly they had better sources for the shows than these DVDs to look at during their recording. A table read for one episode is shown in its entirety, shot with webcam-quality cameras. They say these are done to get a better idea of which jokes work and which ones don't- those in the room mostly laugh at everything but noticeably some lines got changed or dropped for the actual episode. Jeff Bergman isn't present however, instead talking on a speaker from another location. 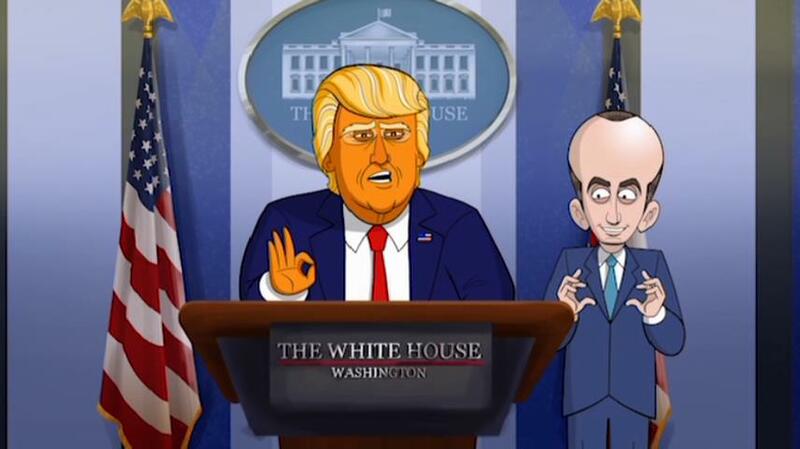 A clip from Colbert's Late Show featuring the cartoon Trump is included, complete with the CBS logo bug and of course down-rezzed to standard definition. 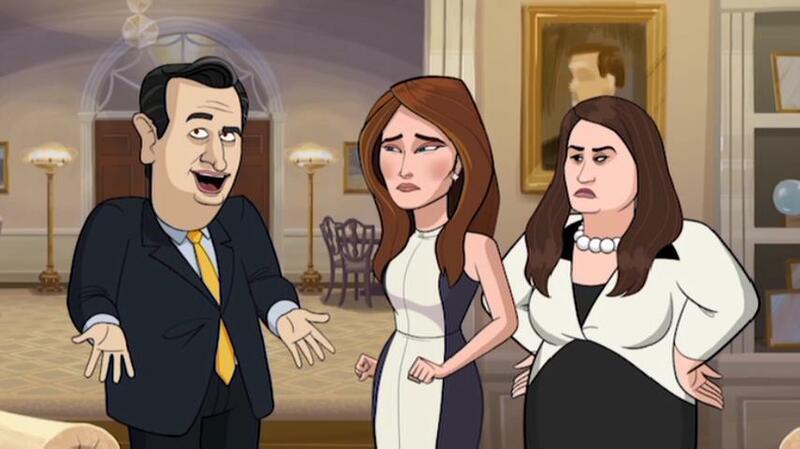 Another animated piece made for the White House Correspondents' Dinner is included, as is test animation for a musical segment and finally a gallery of stills mostly showing off the backgrounds designed for the show- although these appear rather small, on a TV screen in the same style as the episode stills shown during each show's end credits. 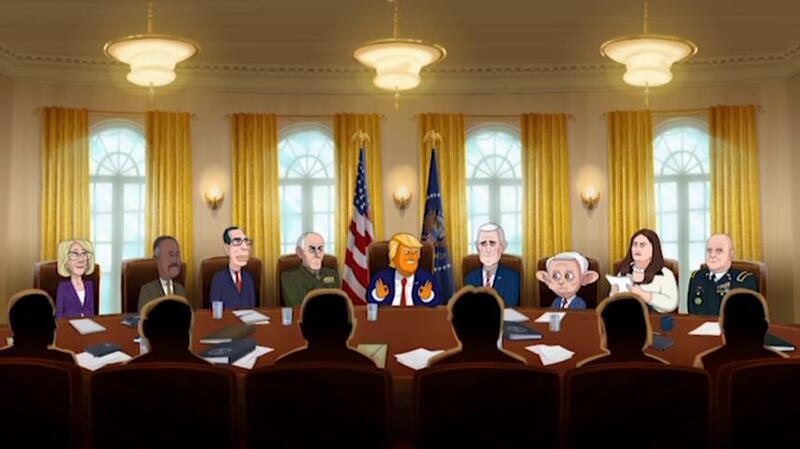 While the Trump Administration is a natural for an animated satire, this one often misses the mark- mainly exaggerating some personnel but not doing so enough for Trump himself. While I welcome its release on disc to ensure that it will be possible to look back on it decades from now when its online presence may have completely disappeared, the standard DVD format simply isn't up to reproducing it well enough.